A fleet of over 90 craft are available from canoes and kayaks through sailing dinghies to large motor craft, and can operate within the dock complex and on the tidal River Thames. The base is manned by a team of volunteers every weekend in the season from February to November, and safety cover is available for all customers who visit the base. Crew that work at the base undertake many activities, and most are trained to run water activities and weekends. At present (2019), we have 4 British Rowing Coaches, 5 RYA Keel-Boat Instructors, 16 RYA Dinghy Sailing Instructors plus 5 Assistant instructors, 11 RYA Powerboat Instructors, 2 RYA, 2 BCU and 2 First Aid at Work First Aid Instructors, 25 BCU Kayak and Canoe Coaches, 4 RYA VHF Instructors & 2 RYA Diesel Engine Instructors almost all of whom are home grown. We regularly run training weekends open to all our staff, so that they can improve upon their qualifications, allowing for a greater variety of activities.The base not only comprises of the headquarters training ship 'Lord Amory' moored by the dockside, but a modern building. This serves many purposes, including housing modern shower, toilet and changing facilities, dry storage for our smaller boats and two large workshops in which our boats and equipment are maintained. This is undertaken by a team of maintenance crew, who voluntarily attend the base regularly (at least once a week) to help put their skills into action. This method allows us to continuously maintain our craft to a high standard, whilst having a permanent team ready to fix things when they go wrong. Finally, a great success of the Project has been the Quartermaster's scheme, which has been running for several decades. The scheme provides assistance to water activities with young qualified volunteers, who usually attend another youth organisation such as scouts, guides or cadets. They are trained in many aspects of water activities as well as First Aid and have excellent opportunities to gain qualifications whilst in the scheme. When they reach 18, and can no longer be a part of this scheme, most choose to stay on as crew. This provides the Project with a continuous, steady flow of qualified young adults which can assist with the running of your weekend. The uniform worn by members of the DSP is not very different to that of the Scout Association's own uniforms. 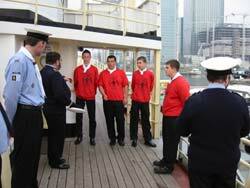 Quartermasters wear a red polo shirt or sweatshirt with an embroidered logo, along with a white scarf. In addition, they must also wear smart black trousers and shoes for formal events such as colours. Crew uniform is very similar, with all members over 18 wearing a navy polo shirt, again with an embroidered logo. A sweatshirt, jacket and fleece are also available. All members wear bright red baseball caps with "DSP Staff" printed on them when running very busy water activities, enabling them to be highly visible to visitors. Apart from manning the base throughout the year, the quartermasters and crew often get together to improve their group and communication skills. Fun days on the water, attending camsp such as Winter Camp and Gilwell 24. The Projects Network team attend events all over the country, taking part in activities and promoting the Project.